Crafted from solid parota wood, this bar has a beautiful, rustic look. 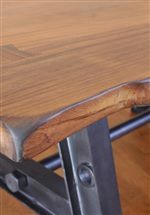 A clear finish lets the natural beauty of the wood shine through, while the iron footrest and accents add a touch of industrial character. On top of its stunning design, the masculine bar offers great function, with a dry sink, bottle storage, and additional storage drawers and shelves. The Parota Wood Bar with Iron Footrest by International Furniture Direct at Godby Home Furnishings in the Noblesville, Carmel, Avon, Indianapolis, Indiana area. Product availability may vary. Contact us for the most current availability on this product. 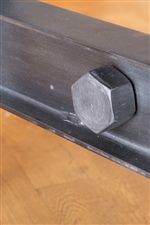 IFD866BAR-T Wooden Bar Top 1 76" 26.5" 2"
IFD866BAR-B Wooden Bar Base 1 66.25" 25.25" 41.75"
The Parota collection is a great option if you are looking for Rustic Industrial furniture in the Noblesville, Carmel, Avon, Indianapolis, Indiana area.